It is a precarious road to getting well for Tinky and she definitely got worse before she started getting better. 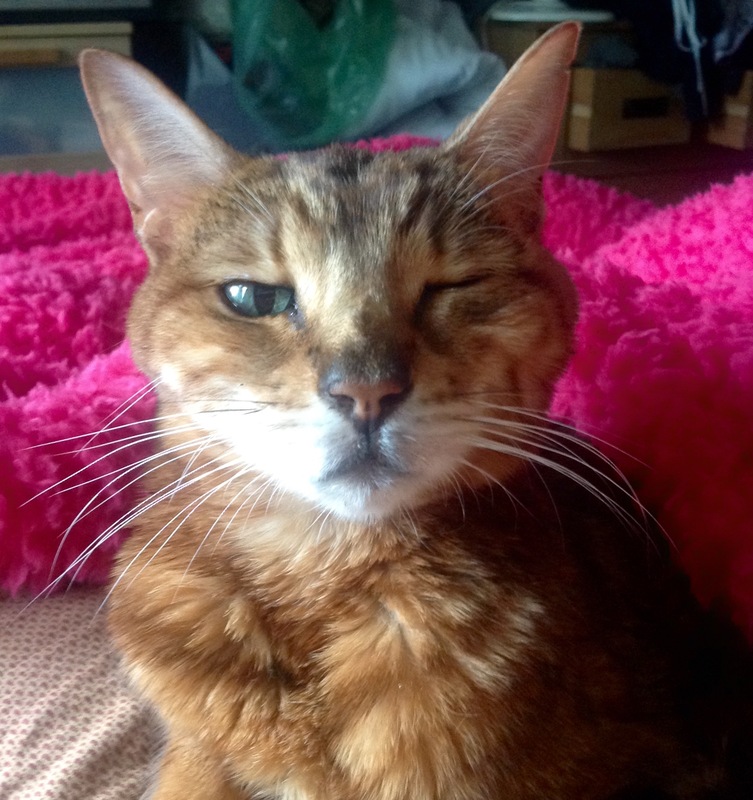 After her diagnosis of chronic renal failure Tinky suffered with loose bowel movements, lethargy and depression. We decided to isolate her in our bedroom. For a couple of days Tinky eliminated outside the litter tray, I think it was her way of telling me how awful she felt. After further precautionary investigation, Tinky looked so small, skinny and helpless, I wondered if she would make it. She stopped washing herself so I took to cleaning her with baby wipes, something she tolerated. I held her in an attempt to share body heat and whispered in her ear, “don’t go, Tinky.” I think she heard me as she started drinking by herself and slowly took to her new food. Our vet suggested Hills a/d as a supplement, which seems to have made a huge difference. Tinky has rejoined the other cats and Bridgette, Fluffy and Victory take it in turns to wash and keep her warm. We need to feed Tinky her special diet separately and we hope she will gain some weight but we are ever vigilant of her. It’s amazing how even Sally and Basil, who are heavy and robust cats are being gentle to Tinky. Each day she seems a little more like her old self and I have a feeling this headstrong stubborn girl isn’t done with me yet. As a fellow cat lover (and owner of 6 cats), I cried reading this. Bless her. But Tinky seems to be strong and with the help and love from you and the rest of your kitties, she should be back to her old self in time. Sending lots of love, strength and happy thoughts from myself and our 6 cats! Thank you, she’s certainly turned a corner and seems to be gaining her appetite back. Thank you, we hope she’ll continue to get better but she has a long way to go.